A previous project engineer stated that over a year and a half more than 50 building code violations had not been fixed including an inadequate fire safety system and faulty structural concrete. A local fire protection company said the system had to be completely replaced. It didn’t meet fire code requirements and was installed by an unlicensed subcontractor. The fire protection company is owed nearly $3 million. 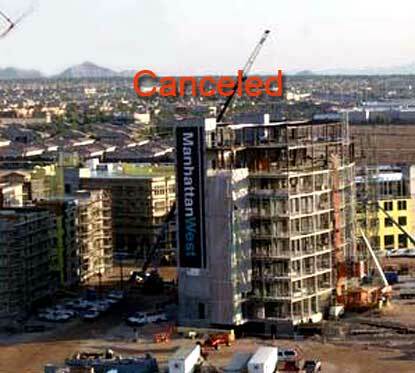 ManhattanWest Las Vegas condos have racked up more than $30 million in construction liens. Construction was stopped last December by the developer. To complete the real estate project needs investors to finish the project. Lienholders haven’t been able to contact the developer including a seismic repair company who’s owed nearly $500,000. The developer has only wanted to start a conversation with real estate investors that had “real” offers. He hasn’t seen a verification of their assets. Topping off of the nine story Element House was done in August. The residential portion of is about 80 percent competed. $30 million in liens against real estate developer pile up halting condo progress.